France’s elite counter-terrorism teams are some of the finest in the world and have proven their abilities and bravery over decades of dangerous operations. Most notable of these teams is the legendary Groupe d’Intervention de la Gendarmerie Nationale which, along with its French National Police counterparts, saw action this week during the horrific terror events around Paris. The GIGN, or in English the National Gendarmerie Intervention Group, is France’s premier military counter-terror and hostage rescue unit, originally formed in 1973 following the hostage crisis in Munich. GIGN belongs to a part of the French military known as the National Gendarmerie, which has no precise counterpart in the military branches here in the United States. With roots going back to the Middle Ages, the National Gendarmerie is a force focused primarily on internal security and order. Its present form is something akin to a militarized version of America’s Department of Homeland Security, with some additional FBI-like responsibilities, as well as some of the roles of the Royal Canadian Mounted Police. Since its founding, the GIGN has seen consistent action. Its members are considered absolute masters of hostage rescue and intervention, especially in high-density environments like buses, ships, trains and airliners. In all, GIGN is said to have been involved in well over 1,000 missions and liberated more than 500 hostages since its founding. These include everything from saving hundreds of passengers from a hijacked A300 to killing Somali pirates holding a large luxury yacht and its crew hostage in the Gulf of Aden. GIGN is known for innovation in technological applications and tactical methods. It trains regularly with similar units from around the world, including Germany’s vaunted GSG-9, UK’s SAS, Poland’s JW GROM, and America’s counter-units such as SEAL Team Six, Delta Force, and the FBI’s elite Hostage Rescue Team. For all its reputation, GIGN was a very small force for most of its lifespan. Though supported by administrative, command, technological, and smaller specialized groups (sniper, intel, aviation, negotiators, dogs etc), the core of GIGN was historically just four troops of about 20 commandos each. This small size limited the group’s operational impact for larger potential terrorist events, but it also concentrated training to a limited number of operators which insured that GIGN “shooters” are of the highest quality. GIGN operators have such a sensitive job, that like the majority of France’s anti-terrorism units, their faces are not allowed to be photographed fully exposed, therefore they are often seen wearing tactical ski masks when operating in public. As with any other special forces unit, disseminating fact from fiction and lore when it comes to the unit’s training practices is challenging, but it is widely rumored that a GIGN commando shoots more rounds per year than almost any other solider in the world and that deep psychological evaluations are given before anyone is admitted to the team. Training is said to be unconventional by any definition, featuring live-fire “trust” drills and placing operators in very dangerous real-world situations, such as at the bottom of the Seine River as barges pass just feet above. GIGN’s washout rates for new recruits exceed that of almost every other special forces unit in the world, with only five to eight percent of would-be members ending up wearing the GIGN badge. In 2007, GIGN’s quaint boutique-like counter-terrorism unit size morphed into a larger entity that could respond to the changing nature of terrorism word-wide. With larger scale attacks becoming more of a threat, proof being in those carried out by gunman in Nirobi and Mumbai, GIGN needed more manpower. Some elite units within the French Armed Services—the airborne Parachute Intervention Squadron of the National Gendarmerie (EPGIN) and the Security Group for the Presidency of the Republic (GSPR), which guards the nation’s president—were integrated into GIGN. As a result, the unit ballooned in size, but it could now put about 200 operators onto a single target at one time. Additionally, GIGN acquired new missions such as VVIP protection, and was given an even larger focus outside of France’s own borders. The changes were seen as synergistic with its core anti-terrorism mission, but some detractors claim GIGN lost much of its identity with its growth after 2007. GIGN’s military heritage shows up in some of the tactics that it can bring to the counter-terrorism fight. Unlike most police counter-terror units, GIGN has the French Armed Forces’ capabilities at its fingertips and has integrated tactics directly with them. These military tactics include skydiving using HALO and HAHO applications, combat diving, and deep scouting and surveillance capabilities. Beyond direct action missions, GIGN also works to forestall terrorist attacks before they happen. A large part of its mission is to support high-profile events and protection of high-value targets during times of perceived vulnerability and heightened risk. GIGN’s weapons and technology include some of the most advanced equipment in the world, some of it highly experimental in nature, along with some very low-tech but proven tools. The unit is at the forefront in counter-terrorism innovation with its tailor-made access and extraction capabilities, which include bridging systems built atop SUVs and steel discs it uses to insert and extract multiple operators at a time via helicopter sling-line. Although the group packs virtually any weapon they see fit, including sub-machine guns from Fabrique Nationale and Heckler & Koch and pistols from Glock, it is well known for its love of .357 magnum revolvers when it comes to close-quarters combat. For decades, and apparently still to this day, GIGN favors the French-built MR-73 and the Smith & Wesson 686. The revolvers’ heavy weight, fixed barrel, inline bore-axis, and lack of a moving slide give them an advantage over automatics. Nonetheless, times are changing and now GIGN operators are often seen packing customized Glocks, sometimes along with a revolver as a secondary sidearm. Although the GIGN is the most notable French counter-terrorism unit, the country has other well-known counter-terrorism units. Groupes d’Intervention de la Police Nationale, or National Police Intervention Groups (GIPN) is one of these top units. GIPN, which sports a cobra as its mascot, was formed like GIGN after the shock of the Munich hostage crisis. It operates as part of the National Police and is focused on internal counter-terror affairs more strictly than the GIGN. GIPN operators are selected from the cream of the French police force. The induction process is challenging, although more akin to that of the FBI Hostage Rescue Team than those of a military organization like GIGN or Delta Force. GIPN is made up of around 200 members distributed to nine teams. Each of these teams is assigned a separate geographical district in France. An additional two teams are located overseas on Reunion Island off of Africa and New Caladonia Island off of Australia. Each team is made up of 16 to 24 operators who know the terrain, local culture, and specific counter-terror issues within their regions. The units, although separated by geography and organization, debrief one another after each of their missions so that common lessons can be learned and leveraged and new tactics can evolve from them. GIPN is considered to have some of the best technology of any police force in the world, often sporting the latest in weaponry, sensors and support capabilities. Like its sister military unit, GIGN, its also has an affinity for six-guns at close quarters. The idea behind GIPN is that their small but super-capable dispersed teams can respond extremely fast to counter-terror and hostage situations as they arise, while also having a particular insight into the area before they show up at the scene of a crime in progress. The French National Police also operates another counter-terrorist unit named Recherche Assistance Intervention Dissuasion, or RAID, which in English means Research, Assistance, Intervention, Deterrence. Unlike GIPN, it is a single, centralized unit, with more manpower available to respond to large-scale terrorism or hostage-taking events at any given time. Founded later than its GIGN and GIPN counterparts, RAID was born in 1985 and currently has an end-strength of about 200 operators and another 200 support personnel. RAID is divided into three units, the first being the shooters themselves, who account for about 100 or so officers. The second unit handles research and development of new technologies, tactics, and the deciphering and exploitation of intelligence. The third unit handles the human elements of RAID’s mission, including forensics, the psychology of both its operators and its targets, and especially the art of hostage negotiations. RAID’s hostage negotiators, said to be the best in the world, are on especially high alert and are ready to deploy within a moments notice. They not only work to deescalate the situation by using a slew of psychological and negotiation tactics, but also act as a scout team for RAID as a whole. Their input and observations are used to gauge what resources are needed at the scene and how RAID will begin to deal with the situation once fully deployed. 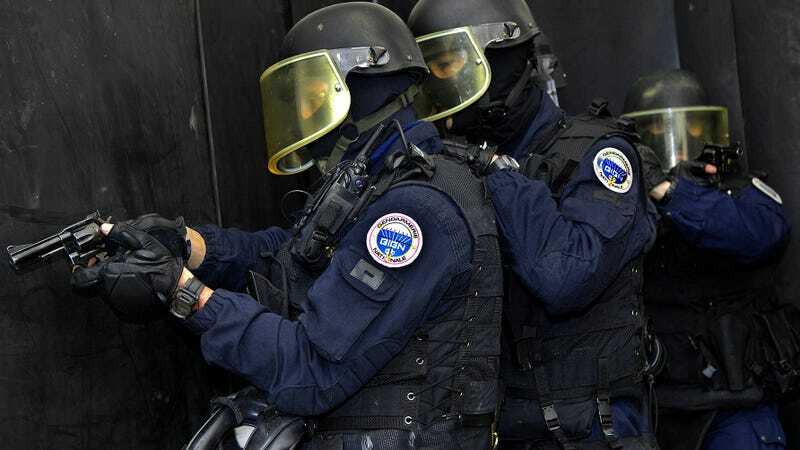 GIGN, GIPN, and RAID also work with a whole slew of national and local police services, one of which is worth noting directly: the Brigades de Recherche et d’Intervention (BRI), or in English, the Research and Intervention Brigade. This unit, which belongs to the French Ministry of the Interior, is focused on tracking organized crime, gangs, and in some cases terrorists, with a focus on stopping serious crimes before they happen through collection and exploitation of intelligence. BRI also has a capable “anti-commando brigade” which is focused on hostage rescue. Its operations don’t necessarily always have to do with terrorism and can be focused on kidnappings, human trafficking or any other sort of crime where people are taken against their will. Nonetheless, the BRI’s counter-commando unit is known to be highly trained and can work autonomously or in support of GIPN or RAID during large operations. As the debate continues on here in the United States in regards to small-town police agencies seemingly trying to weapons-procure themselves into counter-terrorist capable commandos, last week in France showed what fully trained specialized counter-terrorism units can do. When things went terribly wrong inside the kosher market in the Porte de Vincennes area of Paris, RAID, assisted by BRI and other units, was there to see the crisis to its deadly end. RAID in particular was said to have fired the final shots into suicidal hostage taker Amedy Coulibaly as he ran at them out of the exit of the grocery store. Earlier that day, GIGN deployed to Dammartin en Goële to end the Kouachi brothers reign of death following their horrific attack on the Charlie Hebdo magazine offices and the subsequent manhunt that ensued. Using their custom modified bridging and breaching vehicles, along with shooter teams surrounding a printshop building, GIGN exchanged gunfire with the brothers until the firing had stopped. One source tells Reuters that both brothers emerged from the building under heavy automatic weapons fire where they subsequently died at the hands of GIGN shooters. Meanwhile, GIPN operators played an important role throughout the crisis, taking part in the nation-wide manhunt for the Kouachi brothers and standing alert as a quick reaction force. As France picks up the pieces following what was clearly a week of hell, elite French counter-terror units will undoubtedly take on a whole new level of significance and relevance throughout that country’s collective conscious. France will almost surely recoil from these latest acts of terror and proceeds to tighten its grip on extremist elements operating within its borders, and especially those operating in dangerous no-go areas that are not being monitored regularly by normal police. With all this in mind, France’s capable yet still relatively small-in-size anti-terrorism force may have a very large task in front of it if the leadership in Paris decides to go after extremist elements with a heavier hand. I don’t doubt that GIGN, GIPN, RAID or BRI are up to whatever task they are given as this is the exact mission they have trained so hard to accomplish, but the vastness of France’s extremist problem may push their limited but capable resources to their maximum capacity in coming weeks. Additionally, French intel services will have to figure out exactly how these men, and presumably one woman, some of which had been trained overseas at terrorist training camps and were being watched on and off for the last few years by French security officials, were able to carry out such a brutal series of attacks. Meanwhile, western nations are looking very closely at what appears to be a new pattern of attacks, featuring more elusive and internationally mobile enemies (holding western passports) than ever before. If it can happen in France, Canada and Australia it can happen anywhere in Europe or even America, so expect counter-terrorism units across the hemisphere and beyond to begin bolstering their forces and training for what may seem like the inevitable to occur. With any luck GIGN, GIPN, RAID and BRI are helping these units prepare by providing important after-action reports and lesson learned from last week’s very real missions.